People who are confident aren’t any different than anyone else, then have just cultivated habits that allow them to have higher levels of confidence. When it comes to how to be confident, when we become so, life gets easier for us in every realm of our existence. But you may be wondering how you can cultivate these traits into your personality and what the best traits are to do so with. 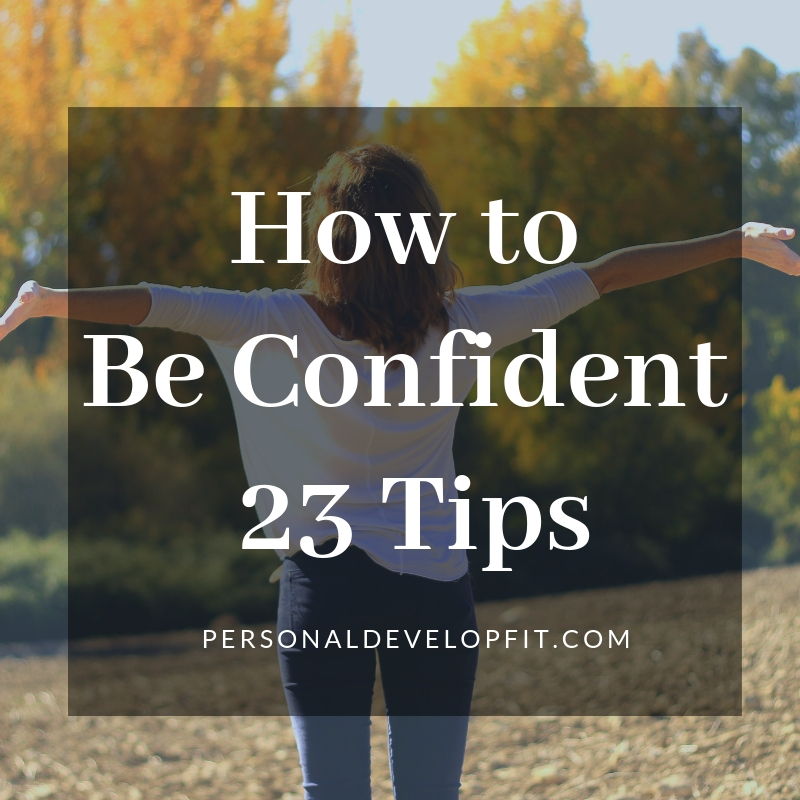 Well below I go into the 23 best ways to build up your confidence levels. The great thing about developing better self confidence is that knowing that you are a product of your past, but you are not a victim to it. Getting out of the mindset that we are our past and start looking at it as what helped us become who we are, can be the first step to changing out entire lives. What happened to you up to this point really doesn’t matter. It is who you become that matters. You are a clean slate whenever you choose to be. When we choose to let go of who we think we are or were taught we are, we can replace negative aspects of our self-image with more positive and self supporting beliefs. It all starts and ends in our mind. The more we develop a better self image of ourselves the better our lives become and the higher our confidence levels are. So this is why this is the first confidence tip I wanted to bring to you. You aren’t the things negative people have said about you or labeled you. You are not what the media tells you that you are. You are not the negative aspects of your gene pool. You are a masterpiece that is waiting to be exposed. We just need to chisel through the negative things that we have chosen to adapt into our personalities and start replacing them with good things. It is imperative to see that we have chosen to believe what other people have told us and that we are responsible for our confidence levels right now. Putting ourselves in this state of awareness will allow us to realize that we are the masters of our confidence levels. If we are responsible for creating low levels of confidence, then we can create high levels of confidence. We all have this power. Building higher levels of confidence is done through daily effort. You don’t just work on it for a few weeks, months or years and then stop. It is a daily grind, just like anything else. You can’t go to the gym for 6 months and attain the body you desire, then stop forever and expect yourself to keep that physique forever. Things in life don’t work this way. This is why we need to constantly seek to improve ourselves. The more we do so, the better we will feel about ourselves. If we keep improving ourselves, the possibilities for developing higher confidence levels are endless. Always be reading something positive, about self confidence or in general. When it comes down to it, when we aren’t trying to be everything we can be, and we know this internally, we feel terrible about ourselves. We feel as if we are wasting our lives, precious time we will never get back. We can end feeling like this for good by integrating constant and never ending improvement. When it comes down to it, most of our lives our on autopilot, especially our thoughts. We are ran by them out of habit of being ran by them. It is a habit that we all get into. We simply believe what our minds say. But at the end of the day we need to start questioning our minds and the validity of our thoughts. Once we do this, we can see the falsehood in what our minds tell us. Instead of reacting to what our minds say, we can look at our thoughts from a non judgmental point of view and let go of what isn’t serving us. Our feelings are powerful, way more powerful than the thought itself. So what we need to do is bring a non judgmental approach to our feelings. We often get trapped in those feelings because of how intense they are. But if we step back from it and don’t identify with it, we can re-evaluate both the thought and the feeling and start replacing these negative aspects of our psyche with positive ones. We have all heard the term “we become what we hang around”. Often times the people closest to us are contributing to our low self confidence. Evaluating everyone in your life can allow you to see who is supporting you and who is tearing you down. It can be subtle, so it is necessary to always be evaluating new people coming into your life and of course the people who you make company with most often. Mindfulness – We need to be aware of how we are feeling when we are around others. Either they are helping us feel better or we are feelings things like depletion, frustration or annoyance. Even thinking about these people when they are not around can allow you to see if they are helping or hurting your confidence levels. This can include being guarded emotionally. Validate people, but do not reinforce what they are saying. Give a little, but not too much of yourself. You need this vital energy to seek and thinking positive thoughts and people. Seek The Positive – We need to start switching up the gossip conversations to something positive. Highlight good things about the people that are being gossiped about so we can switch the dynamic of the conversation. If they continue to gossip, ignoring our efforts to bring up the positive, we need to leave and make an effort of not hanging out with these people. Plan Something Afterwards – If you are around negative people and you become aware of the detrimental effects they are having on you, create plans that will allow you to do something positive afterwards. Watch a positive video, grab coffee with a friend to get their perspective or simply meditate. You can also indulge in some self care activities, which will show yourself that you love yourself enough to take care of yourself. At the end of the day, people are either fanning your flaming or pouring water on it. We need to surround ourselves with as many people as we can that are fanning our flames and we doing the same. The more of this we have going on, the more we can rise to our full potential and help others do the same. We also need to evaluate the reasons why we are hanging out with these destructive people. We need to take responsibility that we attracted these people into our lives and let them stay around. Often times our insecurities can draw other people with the same insecurities. It can be a great chance to grow by evaluating our friendships with people like this. Once we do this, we can evaluate why we have tolerated their presence and how we can go about extracting them out of our lives. It allows us to put our own insecurities under a microscope and evaluate relentlessly, if we are brave enough to do so. You can also create a mastermind group in which you meet up with like minded people who are all seeking to better their self confidence. I talk about the mastermind and how to find one here: Mastermind Group. Will Smith talks about how self discipline is essential self love. It is say that we really want to eat the pizza, but we know that we are going to feel like crap the next day and choosing not to do so by being disciplined is showing ourselves self love. Essentially forgoing immediate pleasure in the form of sacrifice in order for long term gain and self respect. It is essential the essence of the attainment of success, material, emotional and spiritually speaking. There is some sort of weird change in a persons personality and confidence levels when they start to implement discipline into their lives. They show themselves that they have power of their minds in a way where we override our internal desire to take the easy way out. When we want to sleep in and hit the snooze button but don’t or when we want to sit on the couch and watch a TV show but end up pushing ourselves to go to the gym and get a workout in before it closes. The more acts we take along these lines, the more we develop a sense of positive self image and we start to have an internal shift in which we feel as if we are becoming the masters of ourselves. No longer on autopilot. Most people won’t exercise self-discipline, but those who do will reap the rewards many times over. Often times we think someone is confident so we end up adapting certain attributes in which we think we need in order to be like that person to raise our confidence levels. The thing is, is that these people have their own insecurities too. We shouldn’t seek anything outside ourselves to create high internal confidence levels. Confidence isn’t created from trying to emulate certain personalities. It can be a good start to try and emulate people that you want to become like, but we need to develop a sense of deep rooted security. This can’t be done by simply trying to be someone else. True confidence and true happiness comes from being ourselves, plain and simple. The more we seek to develop a better internal health, the more confident we become. It will be long lasting, versus just superficial and surface level. Also it won’t be shaken when confronted, whereas if we are simply trying to act like someone else, as soon as we feel vulnerable, our confidence levels will crack. Because the foundation we built it upon is not solid. Tony Robbins talks about how we need to change our state to change our life. The fastest way to change our state is to do so physically. Which when we do so physically, the mental aspect takes care of itself. Doing intense workouts give us certainty and certainty allows us to feel more confident about ourselves and our lives. This is an inherent need that humans have, the need for certainty. We can provide it daily with working out. Of course our self -image changes as soon as we re-shape our bodies. It also is linked to reducing stress levels as well as making you feel stronger. Two key elements in creating a physical state that completely supportive of high confidence levels. Working out also creates better posture, which leads to feeling more confident about ourselves and outlook on life. A great article talks about how Research at such universities as Harvard and Columbia show a link that it also helps brain function and memory. Studies have also shown how power posing affects confidence, sending a signal to your brain that you are powerful, confident and in charge or your thinking which leads to better and more confident life choices. The article also talks about how bad posture can lead to pain which can affect your brain. Through the likes of slouching you can experience pain throughout your entire body, sending suffering signals to your brain. So instead of your brain releasing happy hormones, it is releasing pain reducing ones in place, taking away from your levels of happiness, which indirectly affects our confidence levels. You can also better your posture through the likes of yoga, as well as in the gym where you incorporate more posterior chain exercises that focus on building the spinal erectors and create good core strength, allowing you to stand up taller and more erect. Humans also have the need for uncertainty. If life was too structured and we knew what was going to happen at all times, we would be miserable. We wouldn’t have any mental stimulation and would be bored to death. Bringing uncertainty to your life will allow you to get out of your comfort zone, sparking new growth, which I believe growth in anyway is a huge factor in happiness and overall confidence levels. There for seeking the uncomfortable in life can be a way to stretch yourself. Take cold showers, do those extra reps, talk to the girl for guy that you have been catching eyes with. Pushing yourself out of your comfort zone may be the closest way to boost your confidence next to working out. We push past fears and when we do, not only do we see how lame they were, but you build some sort of spiritual armor that makes these tasks easier and easier when they come across your existence. So we need to make sure we are pushing ourselves out of our comfort zone, hopefully on a daily basis in order squeeze the most juice possible out of the personal development and growth lemon. Finding our colors by simply knowing what looks good on us and the colors that don’t. What goes best with your hair and skin complexion. Lighter hair people dress well with warm tones and fall colors whereas darker haired individuals compliment well with more softer spring season colors. Dress geared towards our strengths. Curvier types can command attention with dresses more than pant suits for women, or if your arms are your favorite body part, shoot for shirts that may be tighter around your arms. When considering what strengths you have, consider what your torso length, the width of your shoulders as well as how long or short your legs are. These will all help you find articles of clothing that play to your strengths. Always incorporate a personal flair to your style, even when stepping outside your comfort zone. You don’t need to switch things up entirely, but if you do try something new, incorporate your own sense of style to it. This will allow you to step out of your comfort zone but at the same time bring your own sense of style to your outfit. At the end of the day, for myself, I know that when I go places dressed a little better than I know the crowd will look, makes me feel better about myself. No matter how egotistical that may sound, it’s true. It brings a sense of prestige and esteem to my pride and allows me to feel more comfortable in my own skin. If this isn’t the case for you, find outfits that make you feel comfortable with yourself. The more comfortable we feel, the prouder and happier we will be out in the world. We can do this with our style today! There has been a study which showed that if we simply nod our heads when we are thinking things, we actually reinforce what we are thinking, believing it more than not doing so. This is true with both negative and positive thoughts. The opposite is true, if you shake your head like you are saying no, then you have less confidence in your thoughts. This is a simple but very powerful confidence tip where we can literally reinforce positive beliefs and thoughts with this simple tactic. Now we don’t have to do so in public, we maybe hauled off the the looney bin, but we can use this tactic when we need to do so. This is a great thing to do when we are going into scenarios in which we feel that our confidence levels may be lower, like asking someone out, job interviews, first dates etc. And it can be used simply in daily life to combat negative thoughts. You can state the opposite of a negative thought, whenever one comes up, and start cementing in this new belief to replace the crap thought. Powerful. The study also concluded, that this tactic can apply to deeply ingrained thoughts, as in self-evaluation. There is a great article that talks about how smiling and high self-esteem are linked. When we smile at people, it releases endorphins in your brain, ones that make you feel good. You instantaneously feel more positive and exude this feeling of confidence to the people around you. This will help you feel better about yourself as well as build better relationships in both your personal and professional life. When it comes to how to improve self esteem making new friends can really help, showing us that we are desired and worth being considered to be in a friendship. The great things about smiling is that it only takes 12 muscles to do so, versus 113 to frown! It’s entirely free too! Visualization has been talked about in many of the top personal development books on the planet. It is said that in order for something to manifest in the material world, be must first see it. It cannot show up outside if we don’t see it first inside. So when it comes to our confidence levels, not matter how low or high they are, they are completely affected by our thoughts. Human beings think in the way of pictures, that is all that thoughts are. Start by writing down every personality aspect that you want to have. Things like compassion, confidence, motivation etc. Next bring up a mental image of how you see yourself right now. You may see that you already have some of these traits but want to accentuate them more. After step 2, see yourself as having all those traits and notice how you feel and how you start carrying yourself when you are doing this exercise. Probably feeling a little more confident, standing up straighter and feeling higher levels of self esteem or more at ease with yourself. Repeat this process a few times, adding more visual cues until them image starts to shift towards you looking like the person you want to be, inside your head. Do this often, and things will start to shift. Visualize yourself thinking, acting, moving and operating like the person you want to be. This will allow us to take on life in a more secure manner, instead of going into things blind. Carry yourself in this life as the confident person you wish you were. There is a saying that you can’t wish for it more than you are willing to work for it. It is true, we need to practice being confident and we can do so by acting more confident physically, mentally and emotionally on a daily basis until it becomes the life that we live. People don’t become confident by accident. They do things that create self confidence, and they do so over and over again, reinforcing this feeling of high self-confidence. We are entirely a product of our daily habits. Start integrating visualization today into your habits that will create high self-esteem and confidence. Often times we turn away compliments simply because we don’t want to look egotistical if we relish in them. Well my friends, we need to stop this! Sometimes we need to believe what other people say about us even more than what we think about ourselves, until we adopt those beliefs permanently. Allow yourself to feel the compliment completely. This also goes the opposite way, giving compliments to people allow us to fell better about ourselves. There is a great article that talks about how giving compliments boosts self-confidence talking about how it creates a virtuous circle. When we offer someone a compliment, you reinforce their value and strengthen your relationship with this individual. It makes others want to be around you and is actually a form of influence as well as a way to exercise leadership as people are more inclined to follow you since you are having a positive effect on their life. They will be more inclined to help you in this life. Giving out compliments allows us to look good in others eyes. When we do so, we in turn see the good within ourselves. Seeing the good in others is a high form of unconditional love. You are putting out positivity and love into the universe, which is bound to come back to you in some shape or form. As what we give out in the universe has to come back to us. We need to learn to embrace and use the power of fear. Fear can be your best friend or worst enemy. When we allow fear to deter us from doing the things we want to do but are scared to, we simply reinforce that fear. At the end of the day, the things we fear most are the things we need to do the most to better our existence here on this earth. The thing is though that in order to override this natural instinct of running from fear, we need to know that it is a survival method that has been reinforced for over 2 million years. But it was in order to keep us safe when we lived amongst things that had the power to kill us. But today we see things like asking someone on a date in the same light that someone thousands of years ago would look at facing off against a saber tooth tiger. We run and hide and try not to die. But this isn’t the case anymore. Realize this. Acknowledge The Fear – Instead of suppressing the fear, acknowledge it’s existence. Stop pretending like it is not there, give it the power it deserves, but no more than the amount it deserves. Jot It Down – Put your fear down on a piece of paper. This will allow you to acknowledge it even more. It externalizes the fear, lessening the internal power it has on you. You can start to take control over it this way instead of allowing it to take control over you. Feeling The Fear – Step 3 is to be present with the feeling. Also realize there is nothing wrong with you having this fear, everyone has fears, literally everyone on this earth. Worst Thing That Can Happen – Next ask yourself what is the worst case scenario of moving forward with doing the thing you fear? You will realize that the big bad reason behind this is silly. You most likely won’t die! Plan For Battle – Create a plan that will help you conquer this fear and be armed with all type of scenarios that could come up on the way of conquering it. If you want to ask someone else but are afraid of objections, then come up with objection handlers or comebacks that allow you to not feel rejected if he/she says no, or best yet how you are going to react when they say yes! If none of this works, then you need to simply take action fast. The longer you let the fear marinate, the more you will feel it’s affects. Again the more we crush our fears, the less power fear has on us in totality. Lets start facing our fears today, so we can live a more fearless life! Jordan Peterson talks about how when you stand up in the face of the things you are afraid of, you get stronger. Similar to standing up to a school yard bully, we do so and maybe beat up a bit, but when it’s over, the bully doesn’t pick on us anymore and we develop internal confidence from standing up to what we fear. Psychologists use the method of progressive exposure or systematic desensitization to clients who have extreme phobias, but we can also use it with small and large fears in our lives. Fear has so much hold us on because of it’s escalation in which it seems to big to tackle. That is why it needs to be broken down into bite size pieces. If you are afraid of asking someone out, why not start with first nodding at the person whn you see them. Then maybe a little smile the next day. Then the next day you give them an even bigger smile. The fourth day you say hi to them. And so on and so forth until you have more power over the fear and are now courageous enough to ask the person out on a date. Cutting It Off – Start by becoming aware of the fact that you are thinking a negative thought. You immediately put a different thought into your mind when this happens. It doesn’t necessary have to be positive, just think something different so it doesn’t overtake your whole thinking process. Label Your Thought – Remind yourself that the thought is all that it really is, a negative thought, nothing more than that. Realize that it only has the power of you that you give it. If we simply don’t allow it to emotionally charge you then we can simply be less affected by it. Don’t allow you to get trapped in it. Use Affirmations – Lastly, integrate positive affirmations immediately after the thought comes up. If a thought comes up that you will never get ahead, then counteract it with an affirmation that states something like “I am constantly working hard, allowing me to get ahead and achieve every goal and dream I have ever set for myself.”. Exaggerate – Lets say you have a negative thought that tells you that “you aren’t going to call anymore prospects, what’s the use?” We’ll after this, you exaggerate what would happen if you didn’t do so. Your co-workers will tell you you are the worst worker whoever lived and release rabid rottweilers on you when you are about to leave the office. The office will have banners everywhere that you are the worst cold caller of all time. Keep going until you realize how dumb this is and you will start to laugh and you will end up feeling lighter about the scenario and then move forward with it in a new light. Affirmations get a bad word for the simple fact that people don’t take action on them. Action is the key to all success. Lack of it is the key to all failures. When it comes down to it, the more we use affirmations, the more we will reap the benefits from them, just like anything else. We all have strengths that are unique to us. Some of us are better at reading, some of us have natural artistic talent, some of us shoot arrows straighter than others, some of us are better runners. Whatever your natural talents are, develop them relentlessly. The more we better these talents, the more competent we feel about ourselves and the outlook on our life gets better and better. When you are experiencing feelings of low confidence, act on these natural talents right away. This will allow you to squash out these feelings of incompetence naturally and with ease, as you are showing yourself that you are competent. The power of purpose can literally be a cure all for most of the feelings of low self-confidence. When we have purpose, it is funny how things that used to bother us simply don’t anymore. Or at least bother us a little less. The verbal punches that people throw seem to not affect as a much, or failure on the way to our goal is seen as a stepping stone instead of a reason to give up. Even the Bible says, without vision, the people perish. It is true. I know that in my life, when I haven’t had purpose or something to wake up and live for, my life has been a wreck. The quickest way to find purpose is through the act of goal setting. Set goals that are so powerful that they make you want to jump out of bed in the morning. Create a clear vision of each of these goals and thinking about them when you wake up in the morning and before you go to bed each night. Write them out daily to keep them fresh in your awareness. What we think about most will manifest itself. We are a sum total of our thoughts, which the most dominant ones almost always manifest themselves. When we go after our goals and purpose in life, we end up having more energy that we naturally use to focus on our goals with. When we are in active pursuit of our goals and purpose, we feel purposeful. When we feel purposeful, we feel highly confident and competent. Start with small goals that will lead you in the right direction. This will give you and I a feeling of winning along the way. It will allow us to gain the confidence need to keep pushing through. Once we accomplish a goal, we feel better about ourselves. Goal setting isn’t even about getting the goal, it is about who you become along the journey that really counts and what boosts our confidence levels in our self. We start believing in ourselves and our abilities, which is s a recipe for success. Mediation is an ancient method of quieting the internal chatter, including negative thoughts that are robbing us from higher self confidence levels. The act of quieting your mind is temporarily eliminating the cause of suffering, which is thinking! When we quiet the mind, we feel a sense of inner peace and quiet. Peacefulness and low confidence cannot coexist. Stress and anxiety are huge factors in affecting our levels of self-esteem. If we can lessen these feelings of anxiety, then we can feel better about ourselves and our lives. We will also operate more effectively, allowing us to get more done. Which when we get more done, we feel better about ourselves. An awesome upward spiral. The best way to learn to be comfortable with ourselves is to simply be with ourselves alone. If we are constantly trying to distract ourselves, though the likes of social media, going out with friends and even though positive outlets, we never really get to know ourselves. Self discovery is done through the act of really sitting with yourself and asking the big questions. What do you want to be remembered for? Why are we here on this earth? What do we really want out of life? When we ask these big questions when sitting alone with ourselves we are seeking our highest calling for whey we are one this earth. There is an internal shift in you to where you are now not only getting to know yourself, but you develop a sense of mission for your life when you start to answer these questions. Your deepest souls desires are revealed to yourself and that is when we boost our levels of confidence, especially when we start to at upon them. Once we begin to know ourselves better, we start acting in a way that we were created to do so in. Once this happens, I truly believe the universe starts to support our daily acts in a bigger and more powerful way. Catapulting you to heights you may have never thought possible. When it comes down to it, we are not only wasting time in life, we are also sabotaging ourselves. Either consciously or subconsciously. We need to become aware of how we are going about doing this. Often times we fear failure or even fear success, don’t want to do better than our parents or simply drink too much and too often. These fears and actions are used as way to sabotage our own success because we simply don’t feel worth it. Or we feel that if we attain the success we are trying to sabotage ourselves from, we won’t be able to keep it up, making us look and feel like a failure. But the more we indulge in self destructive behavior like this, the worse we feel about ourselves. We need to evaluate where we are sabotaging ourselves and work create a path that sends us in a direction away from these bad habits. A great article talks about within our actual selves is an “anti-self” in which it is against us. Mathew Mcognahay says something similar in once of his commencement speeches that we all have two animals in us, one good and one bad. And they both gotta eat! Anyways this “anti-self” is similar to what we refer to as self hatred. IT is the critical inner voice that speaks to us as an internal enemy. It is shaped by early life experiences, the beliefs we adopted as well as how we were treated as children and young adults. If we were lonely as children, we may grow up to feel social uncomfortable or unworthy. Another great article called beating self-sabotage talks about how in order to stop self sabotage, we need to start becoming cognizant of our own self-sabotaging behavior. For example identify goals that you have wanted to accomplish but aren’t pursing? What are things that you fail at for no obvious reason? Are there times were you are aware of yourself being angry and frustrated which affects or ends relationships in your life. Any of these acts or traits are forms of self-sabotage. We feel as if we don’t deserve a good relationship or a goal. Next we want to monitor what we are thinking and then challenge these thoughts by asking what thoughts lie behind these self-sabotaging acts or thoughts and do these thoughts have any rationality or validity. By looking at what lies behind our behavior we are analyzing this anti-self and seeing it’s falsehood. This is a truly a form of therapy. You can identify what has been holding you back from success and happiness with this tactic. Lastly, we need to swap out these negative beliefs by starting to state positive and encouraging things. Then we can go about setting micro-goals that start moving us towards our preferred outcomes, that get us slowly starting in the right direction. Accomplishing these micro goals will give use the confidence in ourselves that we deserve to move toward a happy future that we deeply desire. First off, when we compare ourselves to others, we are immediately telling ourselves that we are not good enough. We need to realize that everyone has feelings of inadequacy, even the people you are comparing ourselves to. Also we don’t know the other persons journey to possessing the traits or personality that you want to emulate. It is possible that they are simply faking it. Or their lives were so terrible that they got tired of being a certain way and put massive action into changing their lives and confidence levels. A good way to stop comparing yourself to others is to of course, look internally. Write a big list down of all the accomplishments that have ever had, small and large and allow yourself to realize your value. You can also learn to admire these people that you are comparing yourselves to as a sort of mentor. Look at them as your equl with admiration for who they are and realize that you can become like them by working on yourself. This will take the resentment out of the equation. When you swap resentment for admiration and respect, you will trade a negative charge with a positive charge. This is talked about in kinesiology where muscle testing is used and people go weak when they are thinking negative and are strong when they are thinking positive. The more we trade negative charges with positive charges, our life begins to change. Also, simply just compete with yourself. See how far you have come as well as how far others have perceived that you have come. If you don’t feel as if you have came that far, you may be being a little too hard on yourself. But you can work hard on yourself and check in in three months and show yourself that you have made progress. We are our own worst critic so when you do evaluate your progress, try to do without emotional attachment. Warren Buffet offers a great assignment in which we can engage in that can help us become the person we want to be. It is by forming habits around the people you most want to be like and least want to be like. You start with listing out the habits of the people you admire the most, things like them being up beat, positive, funny and generous. Then there is the person or people you despise, whom have traits that can include dishonesty, aggression, negative or humorless. He talks about how when we look at the qualities in which you admire most in the people that you love most or want to be like, there isn’t one quality in which you can’t have yourself. Then you can go about becoming like those people by simply integrating those traits into your daily existence. A great article talks about why volunteering your time allows you to build better confidence simply because it gives you more purpose for your life. It also allows you to meet new people and have some positive interactions among people who are giving themselves to a bigger cause. It also takes the focus off of ourselves which distracts us from some of the negative thoughts that affect our mental well being. It can also show us how small our problems really our when we have real perspective of how others have it worse than us. Lastly, it gives you a sense of achievement as it takes you out of your comfort zone. It can help us a ton with social anxieties by intermixing with different people. This gives us a deep sense of belonging. All of which can leader to boosting confidence levels. Tony Robbins has talked about the power that gratitude can bring to your life. It is the fastest access to your higher self. This higher self knows nothing about low levels of confidence, and when activated we tend to feel higher self esteem right away. The best thing about gratitude is that we can literally apply it to anything. As well as ourselves. There is a great article talks about the 3 little-known benefits of gratitude talking about how it has been shown to decrease envy and boost self esteem. When we are envious we are lacking self-confidence because of the fact that we feel as if we are lacking something. It is appreciating peoples qualities as well as your own. You are showing yourself that you can cultivate self worth from within. Which is where all true power comes from. The more grateful you become, the better people you draw into your life. As like attracts like. People will be drawn to us as well, affecting the world around us. It also gives us a better sense of belonging, showing us all we really do have to be grateful for in our lives. It makes us feel more at ease with ourselves, which will allow us to get out in the world and display our best self, instead of isolating ourselves. One of the biggest indicators in self confidence is body language. Often times, depressed patients come into a doctors office slunched over. But when the are treated correctly, their shoulders pull back and they start walking more upright. The best way that I have ever heard to remind ourselves to walk more confidently is to imagine that there is a metal bit hanging from every door we walk through. That we grab onto it with our teeth and that it pulls us up into good posture and that we are standing more tall and proud. This is a tip from a great book called “How To Talk To Anyone” by Leil Lowndes. 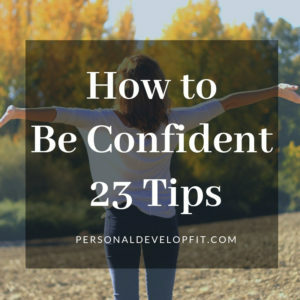 So there we are my friends, 23 tips we can use to build solid self confidence. I truly hope you gained some value from this post and I would love to hear what you thought about it. Also if you have anything to add that can help us all become more confident! Share it in the comment section below!